Photo credit: FaceMePLS, CC BY 2.0. A few days after my fiancé dumped me, I quietly wriggled the Tiffany solitaire off my finger and placed it back in the robin’s-egg-blue box on his dresser. I had found a child-size ID bracelet, with his name in script, in a thrift shop a few years before. I probably paid a dollar for it. I rarely took it off, and the gold plating on the underside had worn away completely. “I’m going to keep wearing it,” I said, squinching my face up back at him. I don’t know who we were trying to kid. A few months later, it was clear this breakup wouldn’t have a miracle happy ending. A part of me was mad I left the ring behind, along with a smattering of other items I didn’t miss as much. I could have taken it and left him smarting from the sunk cost. But a bigger part of me wanted a ring of my own. I had barely unpacked the boxes in my new home, a rented basement bedroom, when I started searching for a substitute for my engagement ring. It was part denial, part comfort. A ring on my left hand signified loyalty, a partnership, an unbreakable bond I swore could revive itself if I just ignored the small fact that he had begun falling for someone else right in front of me. And the comfort. I had gotten so used to wearing my ring for two years (almost to the day) that I felt like I was forgetting something without it. All I had to show for myself, on the eve of my 30th birthday and after more than a decade of misadventures in love, was a thin, extra-pale strip of skin between my knuckles. I poked through my jewelry box, a mix of costume pieces and craft-fair impulse buys. First, I tried a wide vintage band with pavé rhinestones, until showering and hand-washing started to rinse away the stones, one by one. Next, I tried a sterling silver signet ring made by a local jeweler whom I had known and admired for a while. “How are you doing?” she asked, as I tried on a few sizes before thrusting my credit card at her. “I’m great!” I beamed. And then I shrugged. I didn’t need a box; I wore my ring home from the market. I stopped wearing the tiny vintage ID bracelet months before I would have expected my stubborn self to give in. It had become apparent he belonged to someone else, and no level of loyalty on my part could convince him otherwise. So I shut him out of my life completely, but I couldn’t stop thinking about that stupid blue box from Tiffany. I wanted my ring back, but even more than that, I wanted to throw it into a fire so no one else could have it. Can you put a hex on a hand-me-down? The next best thing would be buying my own ring. I had struggled to pay bills the previous year, let alone have the funds to buy myself something so frivolous as a piece of jewelry recognizable more by its packaging than its craftsmanship. I called my friend who I knew had helped pick out my engagement ring. “You want another diamond?” she asked, unfazed after years of listening to my harebrained ideas. It was March. I told her that if I survived my taxes, I’d buy something for myself. Something real nice. There’s this thing called the self-purchasing woman who buys jewelry for herself. More and more women are doing it, because we have access to money now, unlike the entire rest of our history up until about yesterday. In my new single life, I had big plans to be a self-sufficient, self-made, self-whatever woman. If Chloe Angyal could buy herself a diamond ring for finishing her doctoral dissertation, as she explained in Marie Claire, I could get one to prove to myself I was a strong, independent woman. And maybe, for a while, I wanted a red herring, a silent, sparkling flare to tell men to stay away. Get off my territory, a ring would say, regardless of a potential suitor’s intent or approach. This time is mine. My taxes went poorly. As I wrote a $10,000 check to the IRS, I knew my disposable, frivolous, totally privileged income was done for. I visited my friend in New York in May, where it rained the entire time. We happened upon the flagship, movie-famous Tiffany & Co. while angling our umbrellas up 5th Avenue, but we could barely get to the iconic window displays for all the tourists huddled under their awnings out of the drizzle. “They do,” she assured me. “But let’s not go in today.” She knew I was still smarting from the gross miscalculations on my estimated tax payments. By this point, for reasons of tradition or frugality, I had talked myself out of buying myself a diamond. Instead, I wanted a narrow band from Tiffany’s 1837 collection. Sterling silver would do. And when I got out of debt, I promised myself, I’d get one. All my credit cards have been paid off for a few months, a victory I celebrated while noting the one-year mark since my relationship crumbled. But I’m still wearing the silver signet ring I bought last winter. 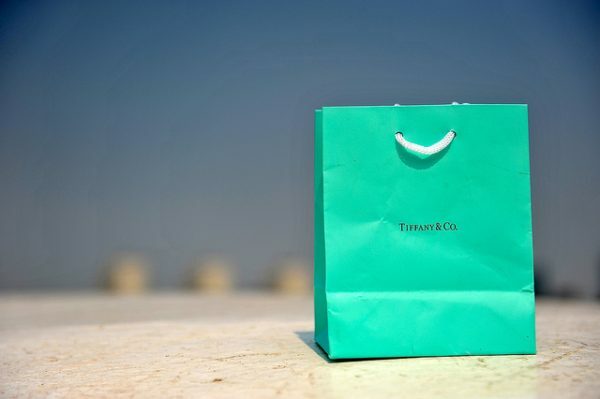 Driving to the Tiffany’s at the mall in Tampa seems about as un-glamorous as typing my credit-card number into the website and having that blue box show up on my doorstep next to a jumbo-sized shipment of cat litter. Is buying a piece of jewelry, no matter the size or price or reason, a “you’ll know when it’s the right time” event? My practical side would say my desire for an obvious symbol of being spoken for is fading. The rest of me would tell my practical side to shut up and wait to see what happens next. Lisa Rowan is a writer, producer and podcast host living in St. Petersburg, Florida.